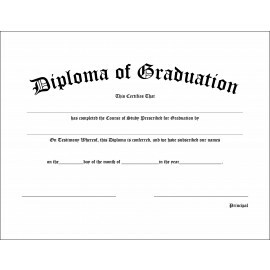 Enjoy huge discounts when you order Gradshop's Middle School Graduation Diploma Certificate in Bulk! Choose from the regular blank diploma or the fully personalized middle school custom diplomas and decide on which one totally meets your needs. You can save even more whenever you order any of our gown, cap and tassel packages online. Gadshop has built a solid reputation as a leading provider of top quality graduation apparel for graduates all over the world at the most affordable rates. There's no need to look anywhere else because we've got all your middle school graduation diploma and other graduation needs covered. Get in touch with our friendly staff right now!